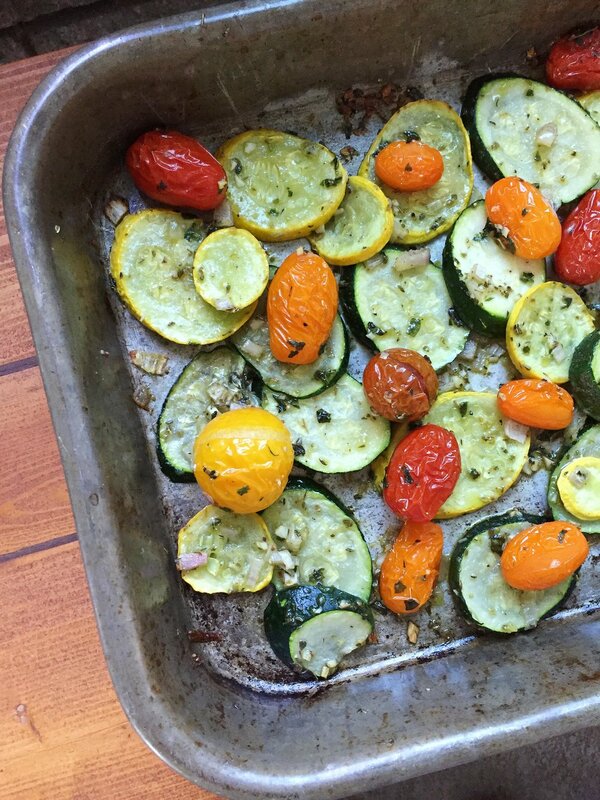 Yellow squash, zucchini and grape tomatoes team up with herbs in this east side dish to sing the real song of summer. Nutritious and delicious, this simple side is surprisingly filling. Hear that? It's my stomach growling. Skip to the recipe, please. If you could only ever have one side dish ever again, what would it be? Honestly, I don't know if I could answer that myself. I'm kind of a side dish fiend. Sometimes I need to remind myself that you don't have to have 2-3 with every single meal. I like it all. Mac and cheese. Tabouli. Stuffing. Fruit salad. Sweet potato casserole. I love sides so much, sometimes I'll get a bunch of them as a meal if a restaurant has good ones. I do what I want. 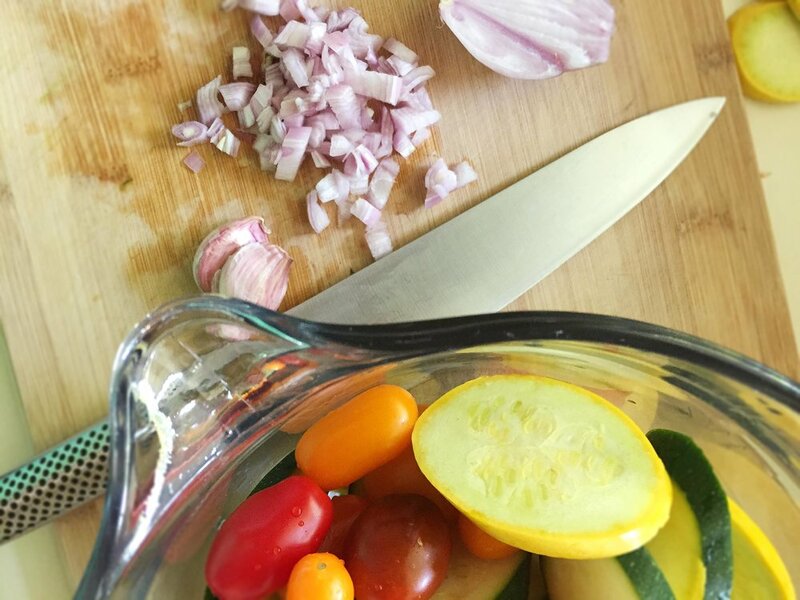 Through it all, there's a soft spot in my heart for veggies. First, I just love the way they taste. Second, I love the way they make me feel. I know I'm doing something good for my body when I eat them, and it's a health solution that doesn't involve rocket science or too-good-to-be-true fixes. As I get older... I can definitely feel if I'm not eating enough of them. So if I really had to narrow down to my top five, roasted summer squash and tomatoes would for sure make the list. It's one of my most-made side dishes. It's such a favorite that a form of it was one of the four(!) side dishes at my wedding. It was also a frequent item on the menu when I was doing personal catering. It takes a little prep to get it together, but what it comes down to is throwing a bunch of fresh foods on a sheet pan and roasting it until everything is nice and soft with some crispy spots. The zucchini and yellow squash are perfection when they start to get nice and roasty, especially with the garlic and shallots pitching in. The tomatoes add the perfect tangy twist, almost like a tomato sauce. It's one of those dishes that tastes fresh and bright, but still comforting and satisfying. You're not going to regret only making one side dish if you choose wisely, and this is choosing wisely. Mincing garlic and shallots will be the thing that turns a lot of people off of this recipe, I think. Both can seem daunting to beginners, and it might seem unnecessary to people who just want dinner on the table. Here's the deal. If you're TRULY in a crunch, you can just cook the squash and tomatoes with some olive oil, salt, pepper, garlic powder, dried oregano, and any herbs you have on hand. I get it, I really do. We’re all busy, and taking the time to make dinner can seem like such a killjoy when you’re on a roll with other tasks. I’ll be honest, I do this almost as much as I do it my preferred way if it's a weeknight. BUT... and this is an important but. Here’s the thing. If you don’t do the work, you’ll never get better at cooking. Do you believe there will ever be a time when you’re less “busy”? Do you believe there will ever be a “right” time? There might be. Then again, if you’re one of those people who is constantly saying “yes” to the next challenge and who enjoys work, there might not be. A 2016 New York Times article about health habits to build in your 20s points out the decisions we make may be more long-term than we realize. That goes for heart health, how we look and feel, and potentially how much weight we carry. Cooking is like anything else you do. It takes work. It comes to some people a little easier than others, but ultimately what you get out of it is what you put into it. 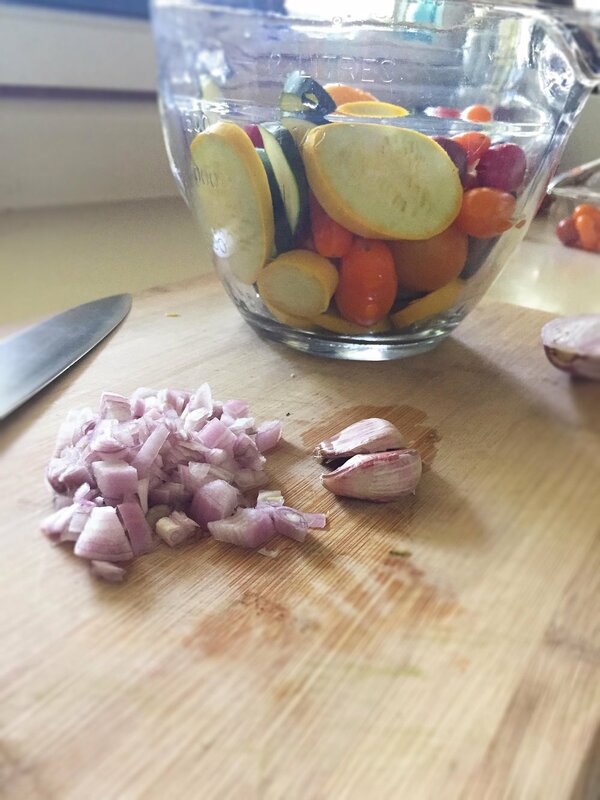 If you take a little time a couple of times a week and learn how to effectively do the basics—chop an onion, mince a shallot, crush and mince garlic, cut a tomato in a way that doesn’t leave you wondering if you’re doing it right… you will slowly but surely learn how to cook confidently and more quickly. That’s the hard truth of cooking. Sometimes what makes it take so long is being in the beginning stages. Wavering over how long it’s going to take to cut an onion, rather than knowing it takes a minute or two with experience. Wobbling as you cut the potato, because how are you supposed to cut something round anyway? It takes practice. It takes being slow for a little while. But it's an investment with clear, guaranteed results. Listen, you have to eat. No matter what, you’ll have to spend some money, go someplace to get the food (cooked or not), and spend time waiting for and eating it. If you take just a few nights a week regularly to work on making it yourself, you WILL get better. You'll need to look some things up, maybe more than once. You may need to ask for help. You may burn a meal or two. But soon, you’ll figure things out well enough that the struggle won’t be how to get something cooked. Instead, it will be how much effort you feel like putting into it tonight. To add a new ingredient or not? To leave out that hard-to-find, expensive ingredient you’re out of, or try a substitute? To bother plating it, or to let everyone serve themselves right from the stove? I'd serve that right. from. the. stove. Not only will you develop skills, but your brain will start to recognize which flavors go together. What things cook similarly enough that you can put them together in the oven and not burn them. How to throw together a meal with what you found on manager’s special at the supermarket, or what came in your CSA box. You’ll learn to cook on the fly, and how to plan to cook based on your resources. THAT is how you get reasonably healthy meals on the table most days. The goal for most of us, after all, isn’t to become a chef. That’s what culinary school is for. It’s to be able to cook tasty food that fuels your body. It’s to enjoy one of the pillars of life: creating food to eat with your loved ones. Decent results for making a delicious side dish a couple times a week, right? So, what's your favorite side dish of all time? Let me know in the comments! I'm always looking to add something new to my ever-expanding list. Yellow squash, zucchini and grape tomatoes team up with herbs in this easy side dish to sing the real song of summer. Nutritious and delicious, this simple side is surprisingly filling. 1. Preheat your oven to 400º F and place a rack in the top third of your oven. 2. Combine all of the ingredients in a large bowl and toss them gently with your hands, distributing the seasonings as evenly as possible. 3. Lay the ingredients out on a rimmed baking sheet in one layer (some overlap is okay). Bake until the tomatoes blister and the squash pieces begin to brown on the edges, about 15-18 minutes. Before you go, I want to let you know about a resource I created. 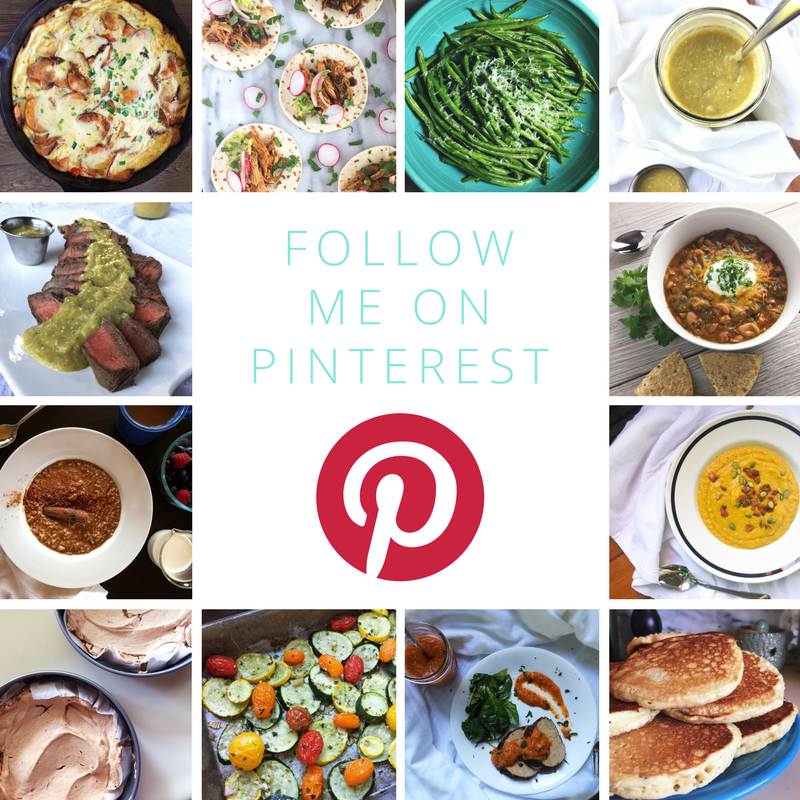 If you're still a little intimidated by anything outside of microwaving, I created it just for you! The WhipSmart Kitchen Guide to Mise En Place is a workbook I put together to show you a method to the madness of cooking. You can use as much or as little of it as you like, but I think every beginning cook should at least get familiar with the concepts in this booklet. Just click below for a free download and let me know how you like it!